Elsevier and the American Medical Association have partnered to co-publish this ICD-9-CM reference by Carol J. Buck! 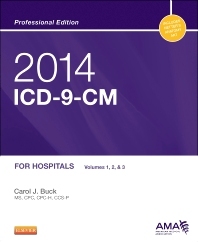 Code more efficiently and effectively with Carol J. Buck's 2014 ICD-9-CM for Hospitals: Volumes 1, 2 and 3, Professional Edition. Designed by coders for coders, this reference combines Netter's Anatomy illustrations and the Official Guidelines for Coding and Reporting. Its format makes it easy to access the ICD-9-CM information you need to stay up-to-date and ensure the most accurate billing and optimal reimbursement in physician-based and inpatient coding settings. In addition, you can take this resource into your certification exams for enhanced testing support! Coverage of all three ICD-9-CM volumes includes all codes for inpatient (hospital-based) and outpatient (physician office-based) coding. Unique! Netter’s anatomy art included in the front of the book and cross referenced where appropriate within the Tabular list helps you understand complex anatomic information and how it may affect coding. More than 130 full-color illustrations make it easier to understand difficult terminology, diseases/conditions, and coding in a specific category. Full color throughout with consistent color-coded symbols and text provides easier access to codes and coding information. Color-coded Table of Drugs simplifies code selection. Official Guidelines for Coding and Reporting (OGCRs) are listed and also integrated within the code set, providing fast, easy access to the official coding rules. Additional elements within specific codes provide you with useful hints, tips, and definitions to supply additional coding instruction and aid in understanding difficult terminology, diseases and conditions, or coding in a specific category. Use Additional Digit(s) symbol in the Index identifies codes that require an additional digit and serves as a reminder to check the Tabular List to prevent inaccurate coding out of the index. American Hospital Association’s Coding Clinic® citations provide reference information regarding official ICD-9-CM coding advice that will enhance understanding of specific codes.